Hello and welcome back to another awesome release week with My Creative Time. Have you seen the new sets that are out this week from My Creative Time.....talk about FABULOUS!! They are all on sale through Friday, so don't miss out on your chance to get a great deal on these wonderful sets. Today we are showcasing the new What's Growing On stamp and die set. Aren't those little mustaches awesome?!? I just love the Emma's signature stitching all the way around them. For my card, I wrapped a little bakers twine from The Twinery. around the front piece with the super fun stamped sentiment from this What's Growing On set along with the mustache die cuts. I embossed the card base with my Cuttlebug and one of the embossing folders from the starter set. Don't forget to hop on over to the My Creative Time blog to see all the other projects made by the design team and to get more chances to win the giveaway mentioned above. Congratulations!! Please EMAIL ME with your shipping address so that I can get your new goodies out to you. You have one week to claim your prize. Check back all week because I will have some super fun projects every day this week. Love the embossing and how you framed everything with twine!! Beautiful. I love the twine around the image. It really makes it pop. TFS. What a super adorable card!! love the embossing and love those new stamps and dies! Oh my goodness these are a "must".. Adorable card. Adorable, Amy! Love the twine frame and the chevron embossing! Too cute!!! GORGEOUS Amy!!! LOVE that chevron embossed background...haven't seen it before! It is perfect though!!! I love this card, it is just lovely! I'm not one who goes gaga for mustaches, but this is just too nice not to like! Thanks for sharing. Amy ~ Oh my this is soooo CAS! I LOVE it! LOVE the black and white theme you have going on too! AWESOME job! Your projects are always perfect. Such a fun card! Love the clean look of black and white =) TFS! Must have MUSTache! This is great! Great job on your card! I like the twine frame...how did you attach the twine? This is so simple, but so sharp looking...I love it!!! Amy: Your card is awesome. I love the whole black and white theme and the way you framed it with the twine. Love, love, love the twine. Great idea. Thanks for sharing. 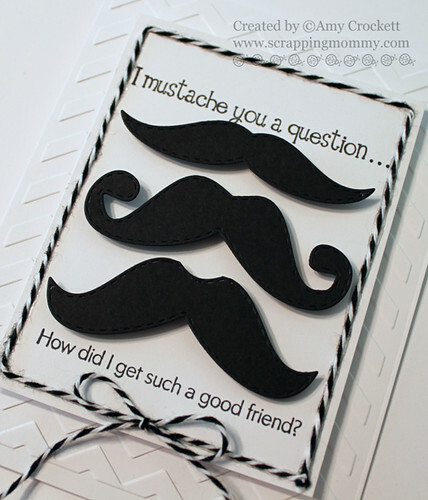 Such a cute card -- love the touch of twine and the various mustaches you used. TFS! Cute card:) I love the black and white twine you added around the card. Cute card. Love the way you framed the mustaches with the twine. I also like the embossing. Cute card. Love the sentiment. I love the whole card. Simplistic black and white! I really like how you framed with twine. this tag card is soooo cute! I love it! thanks for sharing! This is simply gorgeous! I think I muct get that embossing folder...I love it! It really pops on your white card! The twine is the perfect frame too! So pretty. Love the twine frame. You outdid yourself. So simple and cute. Love it and that you trimmed it with twine. Love how you used just black and white. The twine is awesome! Great job! What a cute idea!!! Love the twine!!! Very sweet. I like the black and white. Very cute card, thanks for sharing. I LOVE your card! The black and white looks great and the sentiments are so cute! 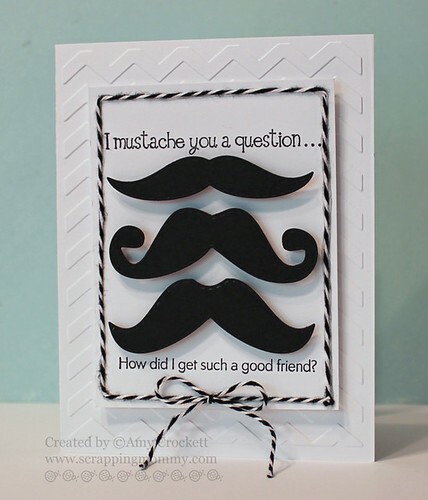 Marvelous mustache card--love the twine. Congrats to Scrappindilly and what a fab CAS card, love the embossing TFS amy. So cute! You've created such a fabulous card! I just love these mustaches.. How could anybody not? Cute card! I love the sentiments. Hello Amy! Love the black and white theme. Very Classy! Thanks for sharing. So cute..those mustaches just made me smile! Cool. I like that embossing folder you used. Super cute!! I love how simple this card is! I can do this! Great looking card. Love the dies. Super cute! These dies and stamps look like so much fun! TFS!